September 3, 2009. Victor Mazella checked with Heaven, most likely a Lunn built Dolphin but we are working on this. The following are edited versions of his original email and his responses to your webmaster's follow ups, plus the pictures Victor sent. At least part of Victor's reason for his email was to get information regarding new sails. This is a particularly interesting subject so I have grouped these parts of the email separately. When I first got married (1985) I purchased a 1961 O'Day 24. I didn't know much about boats, but the boat looked very nice - that was 24 years ago. Up until last year I was using the original sails.. They are dated 1961. I purchased a new main from FX sails $1000. It still has the original Palmer 9 hp. engine (lots of tlc keeps it running well). I am now looking to replace the genoa. I was planning on buying a sail kit from Sailrite - the price for the kit will be just under 600$. but once again I'm not up to the task of knowing what questions to ask..the standard sail cloth was listed on their bid is 4oz performance dacron..using this material drops the price to under 500$. I was leaning towards the 5.53 low aspect, hi modulus weight cloth adding 195$ to the cost. Do you know what the original material and weight was for the original sail? The specs that Sailrite is using for the plan seems to be right, but they list the length overall as 25 ft - will that make a difference? My second question is about the hull #. Is there someplace on the hull that the hull # is stamped? 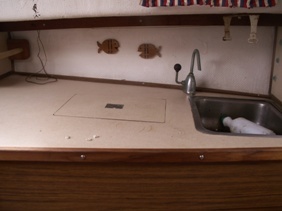 I believe everything is as it was made.. it matches the drawings except that the galley counter does not have the cutback - it's a straight line from the bulkhead of the forward berth to the quarter berth. I really have no info on the boat except that I bought it from a very old man from Northport, Long Island. I can tell you that she is still a very fast boat. 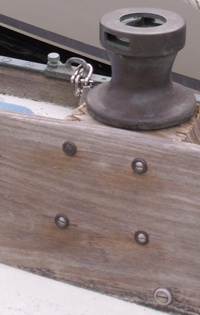 It has all of the original teak combing and trim and most of the original bakalite blocks for the sheets, although I have bought new Harken blocks. Although the decks are in terrible condition they are still sturdy. The gelcoat on the decks is cracked and chipped, but the hull looks very nice with no blisters below the waterline. I bought a new prop 3 years ago from Tacoma Props in Washington State. 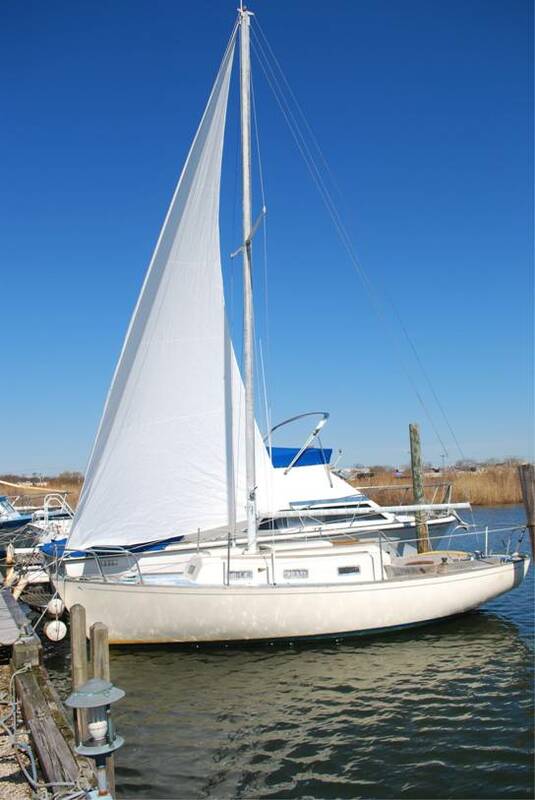 i've been teaching my kids (now 17, 15, 13) to sail her, but i've never let them take it out without me...lol. Sorry for going on and on but I didn't realize that this boat was anything special..(except to me). 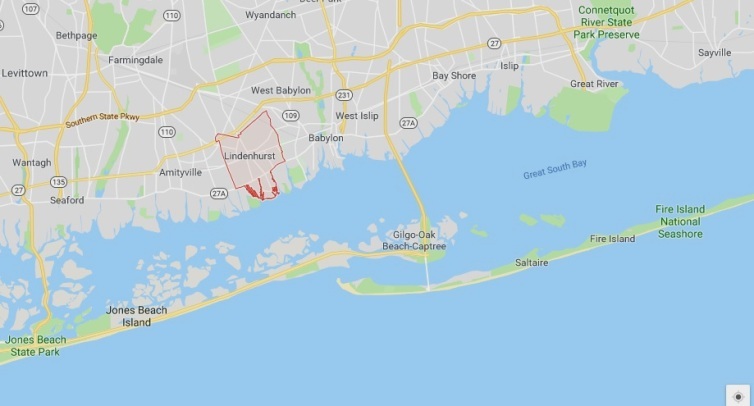 I live on Long Island, Lindenhurst. The boat has been in my backyard for almost 25 years. I know it's a '61 by the registration. 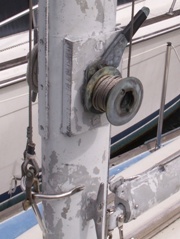 The head of the jib is dated 1961 made by a company on City Island, New York. The date is barely readable now..all 3 sails have the same sailmaker name on them. I was told that these are the original sails by the previous owner..the main has the #40 in red on it (Webmaster Note: we need to look into this) .. i removed the red dolphin from one side so I could copy it for the new main...it's been 2 years and I still don't have it on...lol...although mine is slightly different than the one you show on the website..
Great to hear from you .. I thought I had the only one of these boats left..seems like I'm one of 300..
March 20, 2010. Victor checked in with a couple of updates and a picture of his self made # 2 Genoa. The info exchanged regarding Victor's sail questions and his response to my questions especially about the low cost is interesting. Not many of us have gone so far as to 'make' our own sails. Sailrite is a sailmaker that will provide you the precut sail cloth and you sew and finish the sail. Victor's comments on this subject are incorporated in the Technical Section - Making Your Own Sails. Click here to go there. May 14, 2012. Its been a while since we have heard from Victor. DFI Ian Holzmacher, whose Wanderlust is homeported just a couple of miles away, was out wandering on a beautiful Mother's Day, and snapped the above picture. March 20, 2016. DFI Ian Holzmacher reported that Heaven is still at her same slip in Lindenhurst. Good News. We have lost contact with Victor. My name is Elizabeth. I'm the daughter of Victor Mazzella, who once contacted you about making sails for his sailboat Heaven. 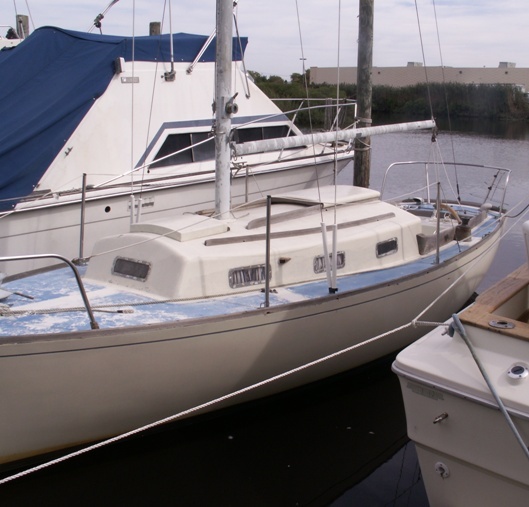 Unfortunately, it is not in nearly as good condition as it used to be, after sitting unused in the water for a number of years I would greatly appreciate any advice or information you could give us on getting it back out on the bay again. The first (big) concern is that the original 8 hp Palmer motor is no longer functional in any way, nor will it ever be again. 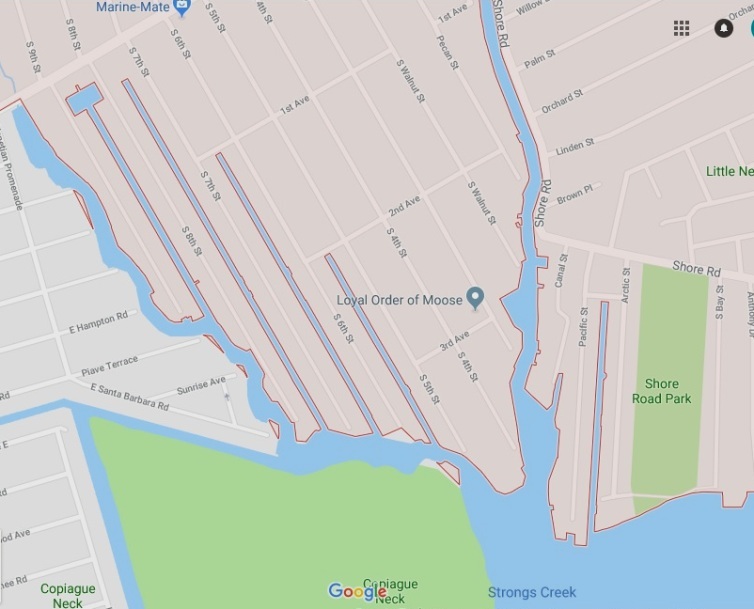 Probably not the biggest concern for a sailboat, except that the canal it is berthed in is not navigable without power; we need the engine to get around several sharp corners. Is it at all possible to retrofit a more modern engine? Got good friend with a nice small power boat looking for something neat to do - towing can be fun! Check with your local boatyard - maybe they can tow you to their yard? . You will probably need to have them do some of the work anyway (like pull out the motor, gas tank, etc.) 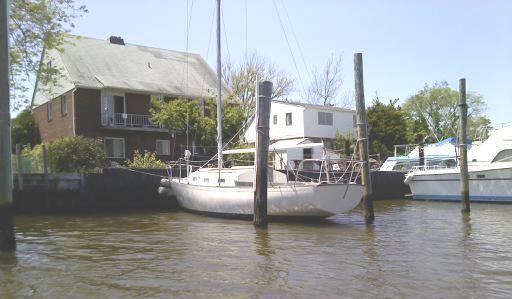 The middle summer months can be slow for boat yards, so its often a good time to schedule work. The other main issues are comparatively minor (ie: within our skill to fix) --The line to the centerboard is broken, but we have the replacement parts. In the meantime, we have a line tied around the keel from port to starboard to keep the centerboard up (the canal is too shallow for the sailboat otherwise). One of the lines to the top of the mast has begun to fray. At the moment we've run some twine through the pulley to pull the replacement through but we haven't yet acquired the replacement line. I assume you are talking rope not wire halyards? We did some work last summer (replacing broken cabin windows and some restorations to the teak) but we have a long way to go and would greatly appreciate some guidance. 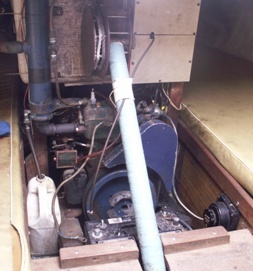 We need to at least resolve the issue with the engine to get it down the canal and haul it for re-painting, as well as repairs to the centerboard (and probably the prop, if past experiences have taught us anything). Please contact me with any information or advice you have, and feel free to post this on your website, I registered a username to be able to follow forum posts as well.